Ahead of the completion of his assignment at the top UN official in Somalia, Michael Keating took some time out to look back on his years of service and the outlook for the Horn of Africa country. Mr. Keating’s appointment as the Secretary-General’s Special Representative for Somalia and head of the UN Assistance Mission for Somalia (UNSOM) was announced in November 2015. His service coincided with some crucial developments in Somalia’s development, including elections and a major drought, as well as challenging security conditions. He came to the job with extensive experience in supporting political and peacebuilding transitions, as well as leading complex humanitarian and recovery programmes, in Afghanistan, the Middle East and Africa. Q. Serving as a Special Representative of the Secretary-General (SRSG) is no walk in the park, especially in a challenging environment like Somalia. What drew you to this job? A. I think it was the opportunity to work in a country and with people that I’ve had a long relationship with because I spent some time in Somalia as a child and then came back at the height of the civil war, briefly, in 1992. To be given an opportunity to contribute to the reemergence of Somalia was irresistible – partly because it was also an opportunity to use some of the experience and skills that I’ve gained in my career, both on the humanitarian side and in human rights and development, but also political – it’s a great privilege to be an SRSG. When I was asked if I would be interested in applying for the job, I jumped at it. And I’m really thrilled I did so. Q. After almost It’s often said that the public perception of Somalia differs greatly and the reality of Somalia? A. The image of a country is shaped by what the nationals of that country say, and also how the international media portrays the country. Somalia has a huge diaspora all around the world, particularly in Europe and North America, as well as in the Middle East and Kenya. A lot of diaspora left in the 90s, at the height of the civil war, and they have very raw memories of that experience. The good news is that some are coming back, but most are still outside the country – they are often very skeptical about the country’s challenges on the basis of the violence and chaos they experienced. The international media, for obvious reasons, is not really present in any substantial numbers in Somalia. They tend not to be able to come here, because of the expense and the insurance, unless there’s a big story and those big stories tend to be related to hunger and drought or violence and bombs – which means that if something goes wrong lots of people turn up, do the reporting, disappear, and then if you google Somalia, much of the reporting is on the negative stuff. But, in fact, if you live here – I’m based in a compound but I get around a lot – you see a different reality. Even in the three years I’ve been here, at the most superficial level, let alone more profound levels, there has been a positive change. Mogadishu is much more dynamic. There are a lot more people in the streets. There’s more stuff going on in the evening. There’s a lot more construction. It’s still quite bashed up compared to how it was in the 1970s and 1980s when there was a beautiful ocean-side city - we’re not back at that stage, but it’s changed, also in places like Baidoa or Kismayo or Garowe. I am not saying Somalia doesn’t continue to face huge problems with so many people poor and vulnerable. But there are positive things going on, and it’s more difficult to report those stories. The one that from my perspective that I think is very important is how there wasn’t a famine in 2017, and reporting something that didn’t happen is slightly more difficult than reporting something that did happen, but that’s a great success story. Similarly, even though there continue to be these very high-profile incidents of violence – the most terrible of which was October 14th, 2017 – actually, by a number of measures, security for many people is gradually improving, and that’s also borne out through opinion polls and focus groups. Q. During your service here, what has been the biggest development on the political front? A. The peaceful transition of presidential power in February 2017. It followed a parliamentary electoral process, and it was a tumultuous affair – complicated, imperfect, with many, many problems associated with it, but it delivered a result that was received as legitimate both by the international community and by nearly all Somalis. Al-Shabaab, of course didn’t welcome it, but everybody else did it. It was a cause for great celebration. As President Kenyatta [of Kenya] said, when he came to the inauguration of President Farmajo, the rest of Africa is jealous that there’d been such a peaceful transition in Somalia, ironically, because many other countries have very fraught electoral processes. Of course, it was very limited, partly because of the security situation, and because the electoral infrastructure such as voter registration and voter education, the electoral law and political party law were not in place. So, while the electoral process was good, the challenge that leaves is preparing for an electoral process in 2020-2021. That has to happen now, and the unfinished business is passing the electoral law and mobilizing the funds both from Somali sources and international sources to build an electoral machine through the National Independent Electoral Commission, as well as focus on voter education and reaching political agreement as the basis of how candidates will be chosen, who’s going to vote, where they’re going to vote, all these kinds of things. Q. What about the biggest development on the humanitarian front? A. The prevention of famine in 2017. I think the peaceful transition of presidential power contributed to the success of that. The first thing the president did when he was elected was say ‘I want a national campaign to deal with this,’ involving the diaspora and business community, as well as the international community. The humanitarian organizations were much better prepared than they were 2011-2012 when a quarter of a million people died. They had much deeper access; people in 2011-2012 sometimes had to move hundreds of kilometres for safety and to receive assistance – that was not the case in 2017. There was also much smarter use of the private sector which helped keep prices down. There was a scope card system whereby beneficiaries could redeem items that they needed – food and water – from stores all around the country that had signed up to the programme. That was a success. And then international partners gave money, real money, and early. One of the dramas of 2011-2012 was that the money came late; it did not allow humanitarian actors and the government to respond. That is not to say that there are millions of people still living in desperate conditions. 2017 resulted in the generation of many IDPs [internally displaced persons]. We think the total IDP population is something like 2.6-2.7 million people, maybe 20 per cent of the population, and a good 60-70 per cent of that stemming from last year. So, what you’re seeing all around Somalia is pop-up cities of people having had to move from agricultural, mostly nomadic pastoralist areas into towns. And that speaks to the challenge of how can Somalia reduce its vulnerability to a combination of climate change, environmental degradation, conflict and, in a way, systemic marginalization of groups, sub-clans or minorities. That’s a big agenda. It’s a tough one because there is money for humanitarian assistance and the money for development tends to be for infrastructure and big projects, and this stuff falls in the middle – where does helping IDPs fit in and how can you get to a point where IDPs are seen as an opportunity for urbanization, for changing the economic basis upon which the country operates, for getting the government to work with landowners to encourage investment Instead, we’re faced with lots of evictions and friction, and IDPs who already had a terrible time find themselves again subject to all sorts of problems. Q. The biggest advances for Somalia in terms of development? A. There’s something that’s happened in the last couple of years where I think this government can take a lot of credit, which is essentially the insight that unless Somalia can start generating its own resources, it’s going to be eternally dependent on handouts from the international community. It’s signed up to an IMF Staff Monitored Programme, a financial and economic reform programme, with the World Bank being very supportive and the UN from a political angle being a cheerleader for this. The Prime Minister is very serious about this, and what we’ve seen over the last 18 months is an increase in domestic revenues from customs and from tax. It’s a real improvement in the ability of the government to manage money and allocate money. For example, you’ve got things like soldiers being paid, they have to be biometrically registered and have bank accounts, and you’ve got a process to review the civil service and how people are paid there. So, there’s generally a real tightening up of the government’s ability to manage resources. That also needs to be rolled out to the Federal Member States. But the prospect is not only of increased domestic revenues – which like any individual or family, is always great when you’ve got your own money rather than from other people – but raises the prospect of arrears clearance and debt relief, perhaps in a year, two years, but not in the distant future. It’s a real prospect if these reforms can continue. That will be a massive green light to the international community, both private sector investors as well as the World Bank, the IMF and all the big donors to invest in Somalia. Q. Security is another key area for Somalia – how has that progressed? A. There’s been some progress, with a big breakthrough being political agreement among Somalis about what the country’s security architecture should look like. For 30 years there’s been no real agreement on that, and last year, in 2017, they reached an agreement and it was signed off on with the international community at the London Conference. The challenge of course is implementing it. It covers the army, the police, the intelligence agencies, maritime forces – but what’s good about it is recognizing that security isn’t just about weapons and kit and training. It’s about building institutions but also about addressing the issues which cause insecurity in the first place. These include lack of justice, lack of policing, lack of basic local governance, and so on. There’s also a strong community rehabilitation and local governance dimension to it – what some call stabilization. There’s a long way to go, and these political agreements are going to take time to translate themselves into real investment. There are lots of practical challenges. For example: how do you get uniform training of the army when you have so many different actors, including international actors, such as the EU, the US, Turkey, the UK, the UN and many others involved in this area. If Somalis can have a coherent approach to security then that’s one of the things the Comprehensive Approach to Security will try and bring coherence to this. This isn’t to say that Al-Shabaab doesn’t remain a massive threat and insecurity is a perennial problem, but at least there’s progress in figuring out how to do it. Q. And how about progress in the area of peace and reconciliation? A. In the area of peace and reconciliation and local conflict resolution, there’s a long way to go. Al-Shabaab remains very violent. It changes shape all the time. It’s now using IEDs and targeted assassinations rather than big operations, although in some areas of the country it’s still carrying out swarming attacks [on military bases/locations], but in cities it’s changed its tactics. So, one of the things that we’ve been very much doing is supporting the government to develop a reconciliation framework, and also getting involved in conflict resolution in places like Galkayo, Galmadug, Merka and elsewhere, and encouraging conflict prevention. The situation in Tukaraq, between Puntland and Somaliland, remains very tense and could get out of control. But for six months, working with partners like IGAD and others, we’ve helped prevent that from getting out of control. Certain conflicts are best helped by the involvement of the government and some aren’t, and for some it’s great to have international involvement and for some to have the internationals stay away. And some of them should be sorted out through women or the business community. Q. How do you see the outlook for Somalia? A. I think that depends upon the degree to which Somali leaders – whether they’re in business, politics or civil society – are willing to work together to achieve a common benefit. Sometimes, the analogy I like to use is that for 20-30 years there’s been intense competition for power and influence and control, including for resources and revenues, over a pie that big. If they work together – having 25 per cent of a pie that big is actually much less interesting than having five per cent of a pie that’s 100 times bigger! Q. Over the years, have you seen signs of donor fatigue from the international community? What can be done to combat it? A. Ironically, as things gradually get better in Somalia, the challenge is to keep Somalia on the radar screen as often the attention of the international community goes to the places which are most high-profile – which tends to be the places where there’s most drama. My message to the international community is that progress is being made but it is reversible. Until Somalia has the ability to pay its own way and manage its own security, it needs sustained and coherent international support. Do not walk away now. At a time when so many things are going wrong in the world, the idea that there is a country where things may be coming together – albeit in a non-linear way, still marked by many incidents of security and with problems with corruption and other issues – where things are gradually improving. I don’t want to be rhetorical about this, you’ve got to underpin that with some factual information, and that ultimately is going to be measured in terms by the number of young people who get an education, by access to health services, by business confidence, in terms of security, which you can measure. I think the indicators are showing that things are improving. For example, five years ago we didn’t have a Federal Member State structure, we didn’t have an upper house of parliament, we didn’t have a National Independent Electoral Commission. There are really very big changes. Q. 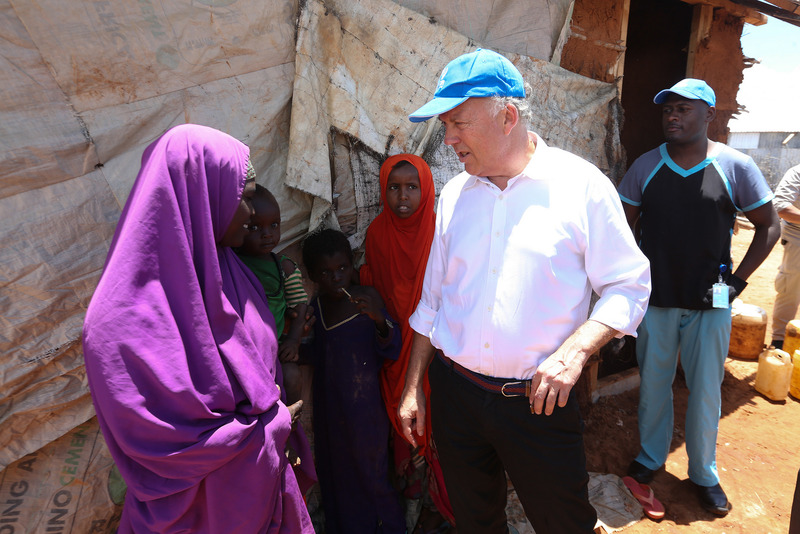 In the years to come, what do you think you’ll back at as a personal highlight of your time as the UN envoy to Somalia? A. I really enjoy working with Somalis. I’ve learned a lot from them. They’re immensely political and they’ve got a great sense of humour. They’ve got something that in my experience doesn’t prevail everywhere: which is that you can have furious rows with Somalis and then be friends. You have a massive argument about something or other in some of the countries where I’ve worked and that would probably result in 10 years of not talking to someone. Doesn’t happen in Somalia! You have that massive row and then you end up having lunch the next day. I’ve also discovered how unique the Somalis are. Somalia is part of the Arab League, but they’re not really Arabs. It’s a member of the Africa Union, but it’s very distinct culturally from the rest of Africa. It’s a very, very unique culture – it’s an oral culture. I think sometimes we assume too much about putting things in writing, but in fact it’s what people say to each other and how they interact with each other, and their relationships with each other that matter in Somalia. And I think that’s what I’ve enjoyed, basically, getting to know lots of Somalis.